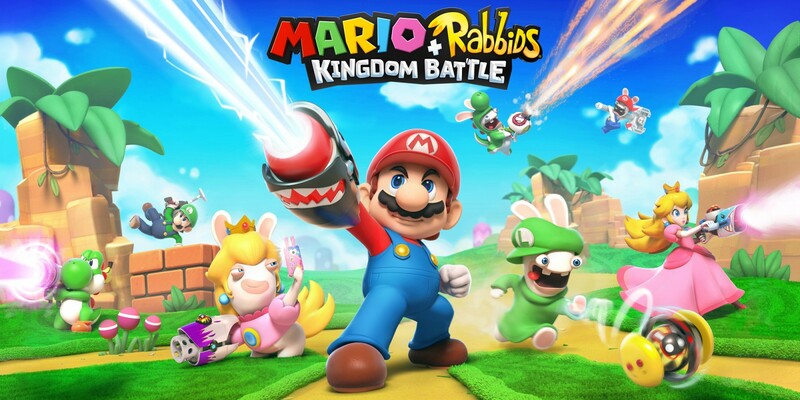 Mario plus Rabbids? Are you feeling alright? Don't worry, eveything is fine. This is the result of a collaboration between Nintendo and Ubisoft. The premise may sound strange but the result is truly spectacular. Mario, Luigi, Yoshi and Peach join Ubisoft's Rabbis in a turn-based strategy game. The gameplay is very much like X-Com in that you'll use cover to protect your team and outflank the enemy, take charge of different weapons to get the advantage over various foes and play to save the world Mushroom Kingdom. The developers have put a lot of effort into making this game shine with the usual Nintendo charm that accompanies the Mario franchise. The levels are colourful and vibrant (though you'll see some darker ones that still pop); secrets that are hidden around the world are waiting to be discovered; and there are cool touches like plants that hoot along to the soundtrack to really flesh out the world. Speaking of the soundtrack, it is composed by the legendary Grant Kirkhope who worked on classics like Banjo-Kazooie and Perfect Dark. It's not hard to hear his influence as the music is reminiscent of Banjo-Kazooie but still delivers a fresh take on classic Mushroom Kingdom tracks. This really is a game that is a delight to see, hear and play. Ok, you've got me. Is there anything more for the non-believers? Check out this gameplay footage from Gamescom 2017. You can also see the first part of my playthrough in the video below the Gamescom one. If you'd like to see more of my gameplay, follow the video through to the GRcade YouTube channel. Last edited by Super Dragon 64 on Wed Aug 30, 2017 12:14 pm, edited 6 times in total. Well... it seems that I am getting this. I'd thought I'd cancelled my pre-order but it's in the post now. I'm not sure about it. It's Mario (yay!) but with those remarkably unattractive Rabbids (uh-oh). Previews appear to have been positive - albeit I've barely watched anything beyond the E3 reveal - and I'm hoping that the tactical gameplay will be something different for the Switch. GR seems to be very quiet about the game, though... is anyone else gonna grab it? My copy is also on the way, looking forward to it quite a lot. ...wow! The game has just landed on my door mat! So, rather unexpectedly, I shall be Rabbid-ing this weekend . The presentation is excellent; Ubi seems to have taken great care with the Nintendo characters and the colourful design really pops on the Switch display. ShopTo, Dragon - it wasn't dispatched until 1920 last night but it arrived this morning . I've just played it for an hour and it is brilliant fun! The presentation is excellent and, although it's obviously very early stages in the game, I'm already impressed by the strategic gameplay. You can use one of your team to throw a character longer distances, and the dash attack (barge into an enemy whilst on the move) is really neat. The controls are simple even with these movement options - I've only used the A button so far! I am excited about how good the game seems... I hadn't looked that closely at previews and so this has come as a pleasant surprise. Edit: Are you back from the USA now, dude? I'm hoping we may see some Nintendo Store photos . Ah. Mine was sent by Simply Games. Hopefully it shows up soon. Yep, I'm back so I'll post them later today. Shopto sometimes get backed up and send out the dispatch emails a lot later than they were sent. Mine came today too. Still on world one but it's ok so far. A very simple Xcom at the minute. I know it won't go as deep as Xcom but it definitely needs a little more. Managed to get a copy in Sainsbury's today as the one I work are selling it early. It scans though the till so other Sainsburys may have it on the shelf too. It's £42.99 but I got 15% off making it £36.55. Shopto usually send Tuesday releases early plus it's a bank holiday on Monday so they had no choice really. Grr. My copy from thegamecollection.net was dispatched, but didn't turn up in the post today. That'll mean I won't see it til tuesday now, with the bank holiday. I've just played a couple of hours and beaten thee first midboss. It really is Mario x X-Com and it works really well. It looks great and the music is fantastic, as you'd expect from Grant Kirkhope. Features like dashing to attack enemies before firing your weapon and effects like pushing them off a ledge into the abyss are cool tweaks to the formula. My only real complaint is that the framerate drops a little at times. You can check out my footage in the archive of the GRcade Twitch channel. My copy of the collector's edition arrived today. God bless you ubisoft store! Yes it's basically xcom - in the best of ways. I'm about two and a half hours into it and it's really good so far, and easily living up to my expectations. Combat is fun, quick and strategically deep. Presentation is top notch, definitely living up to the Mario name. It's clear this was made by Mario fans with tons of detail and references. The review embargo is yet to lift, but from my first impressions I expect this to review really well. I got the collector's edition, which comes in a gigantic box thanks to the 16cm mario rabbid figure. It is actually pretty weighty and well painted, I'm happy with it. Perhaps more excitingly it also comes with the soundtrack, which is composed by Grant Kirkhope (of classic Rare fame, amongst other things). Gonna be playing this all weekend I think! I've noticed that the box states that the game is amiibo compatible... I wonder with what ones and when you get to use them? I love the textures of the brown hill-type things in the first levels... they look sumptuous; almost like lumps of Magdalena cake. I thought this was coming out next month for some reason. I've just spent £40 on PC games for myself so will have to wait a couple of weeks before feeling comfortable getting anything else. Hope you guys are enjoying it, it looks great fun.